MRI is recognized throughout the veterinary community as the cutting edge method to diagnose soft tissue disease and refine patient care. Until recently the challenge for veterinarians has always been the high cost of purchasing a unit and the physical requirements of installation and maintenance. Universal Medical Systems (UMS), with over 20 years of veterinary imaging experience, can help you achieve your dream of providing this valuable service to your clients through our low-risk rental program. UMS will provide and install the Vet-MR® unit and shielding cage, conduct advanced veterinary training for your staff members and provide follow-up applications support. A full service maintenance program and on-going software upgrades are also included in our new rental program. We have a staff of highly qualified veterinary radiologists and neurologists using the same scanner available for consult and interpretation. The Vet-MR family of scanners is the only dedicated veterinary imagers designed and built for veterinarians. The unit can be installed in a much smaller area than a standard MRI and requires only 110 volt power. Through the use of specially developed coils for veterinary applications, image quality is outstanding. Under the UMS rental program you will pay $25,000 for the installation, training, and maintenance of the MRI scanner. In addition, there will be a $495 per study fee paid to UMS. 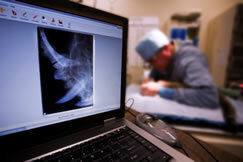 You will be able to set up your own fee schedule for the MRI study and anesthesia. The Breakeven Analysis found on this website will allow you to see how this can become a reality in your clinic. Under the rental agreement, there is no required minimum number of scans and you can remove the unit at any time if you are not happy.